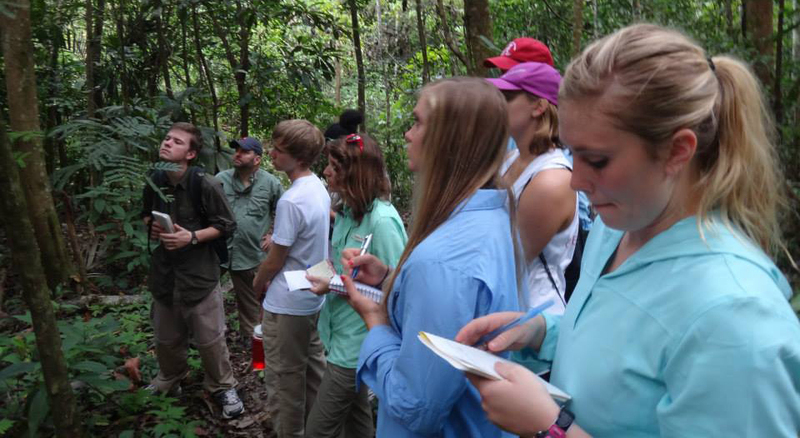 New College students conduct field work in Belize. New College students enjoy multiple opportunities to enrich their learning beyond the UA campus. 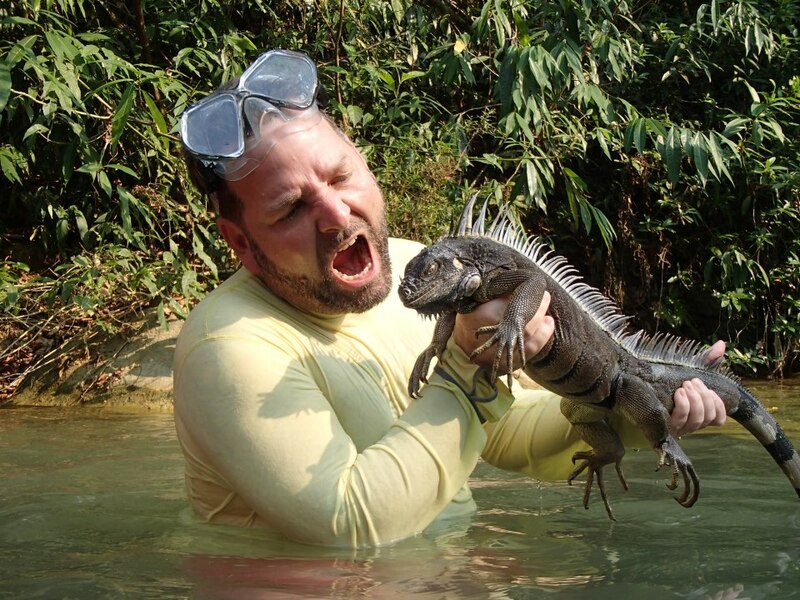 Students can take faculty-led summer trips, such as the Belize trip led by New College faculty member Dr. Michael Steinberg, spend a semester studying abroad, or participate in student exchange programs with sister institutions in the United States through NSE (National Student Exchange, www.nse.ua.edu) or CIEL (Consortium for Innovative Environments in Learning, cielearn.org/ciel-initiatives/exchange-opportunities). Dr. Steinberg converses with Belizean reptile. Through this course held during the three-week Interim semester — between the spring and summer semesters — students explore Belize’s diverse rainforests and coral reefs, and visit Mayan ruins for a glimpse into a past civilization. Belize is unique in that it still contains relatively undisturbed rainforests and the longest barrier reef in the Western Hemisphere. However, while Belize has emerged as an international leader regarding conservation efforts, threats from climate change, poverty, and development persist. The course is designed for students who are interested in conservation issues, biogeography, marine sciences, ornithology, and outdoor adventures. The trip is divided between a rainforest and a marine field station located next to the barrier reef, so students will have easy access the most diverse environments on the planet. Contact Dr. Michael Steinberg at mksteinberg@as.ua.edu for more information. New College students check out a phone box. 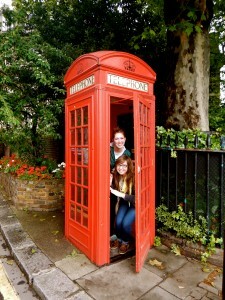 “Studying abroad in London has been an absolutely amazing experience. My depth study is dramatic writing and directing, so there was truly no better place to take the classes I need than London. Here I was able to take creative writing and theatre classes that opened my mind to the expansiveness of the world of literature and performance. “In addition, I also assisted the campus TV station, Fresh TV, which was an absolute blast. By living in London I was a moment’s away from countless forms of entertainment, and I even did work as an extra in films while here! Holly Henning is the UA study abroad coordinator for University of Roehampton, and she’s happy to answer any questions that you might have. Contact Holly at hnhenning@ua.edu. Find out more about UA Study Abroad in London or other study abroad opportunities offered through Capstone International Academic Programs.